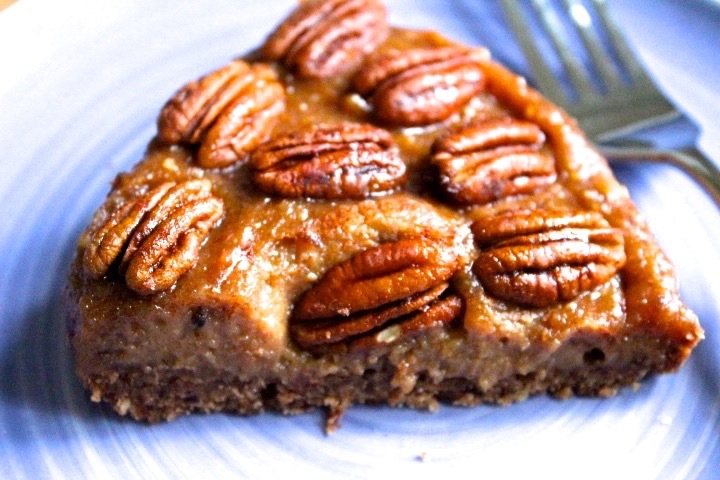 This raw vegan pecan & walnut pie is such a gooey, rich & decadent recipe you would never guess it’s raw & vegan & good for you. Firstly pre-heat the oven to 180C. To make the crust, place the walnuts and flour into the food processor & blend for a couple of minutes. Then add the other ingredients until you have a sticky smooth mixture. Coat your baking tray with coconut oil & place the crust mixture evenly on top using a spatula. Then bake for 15 minutes until browned & hardened. Then prepare the middle section by placing the pecans in the processor until they make a smooth mixture & then add all the other ingredients. Then place your mixture in the fridge or freezer to set. For the topping place all your ingredients in a baking tray and ensure all your pecans are coated with maple syrup & bake on 180 C for 5 minutes. Spread the middle section onto your cooked base using a spatula to achieve an even coating, & then decorate the pie with your pecans on top. I would recommend allowing your pie to set for approximately an hour in the fridge before serving. This is such an amazing recipe that combines all my favourite ingredients and can be made in only 30 minutes. Walnuts contain a high level of vitamin E & anti-inflammatory benefits. They are also packed with omega-3 fatty acids & protein. Studies have shown walnuts have potential health benefits in the area of memory & cognitive function, & brain health. Pecans nuts are enriched with many health-benefiting nutrients, minerals, vitamins that are essential for optimum health. This is a healthy, natural, raw, vegan dessert you will adore & will be feeding your body something nutritious as well as delicious. Summer fruit and herb infusion.